Home » Texas Rangers » The first ten games. 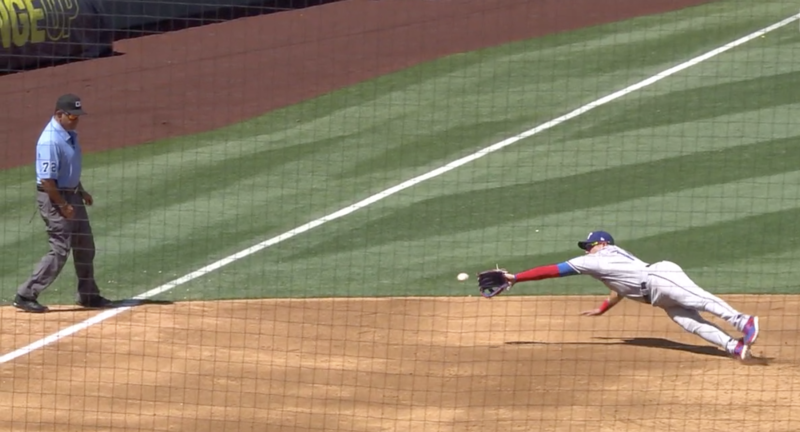 Rangers third baseman Asdrubal Cabrera makes a diving catch of a line drive with bases loaded and two outs, saving two runs for sure, probably three. The Rangers have their first off day of the season to reflect on their first ten games. And what have we learned. After the Cubs series, which the Rangers won two games to one, we learned that the Rangers are capable of rallies, capable of hitting with men in scoring position, capable of comebacks, and capable of being patient offensively. Wining two of three meant it was the first time since September 11, 2017, the Rangers poked their heads above .500. We have also since learned that the Cubs are not a very good team. A few months ago, Baseball Prospectus put out its annual PECOTA predictions. They had the Cubs finishing last in the Central. Everyone was in an uproar about it. Maybe they knew something the rest of us didn’t. Going into the season, nobody expected the Rangers to win two of three. Maybe one. At most. After the Astros series, which the Rangers also won, we learned the Rangers can beat Verlander and Cole. Not just beat them, but befuddle them. The Rangers new patient approach to offense threw Verlander off his game. “Hey, you fools used to swing at this stuff in the past, what’s wrong with you?” He had his worst start as an Astro. We learned the Ranger can go toe-to-toe with the best pitching, even if they themselves don’t have the best pitching. Again, going into the season, when looking at the schedule, being swept was the easy and logical prediction. 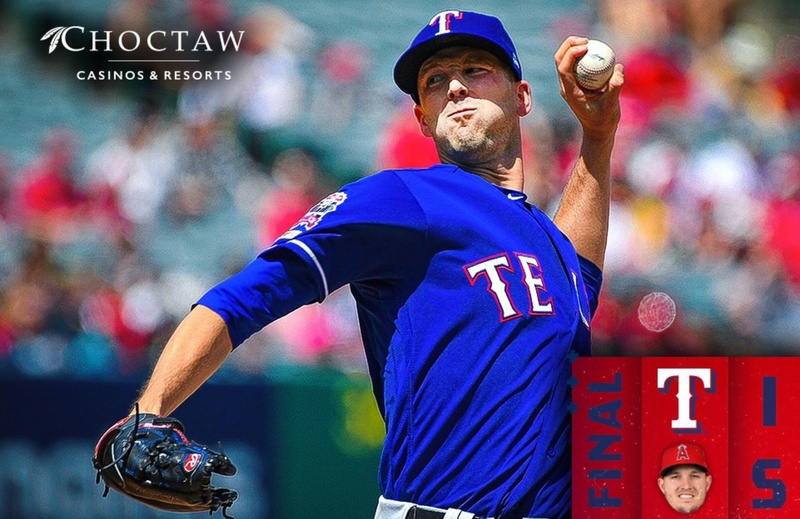 Instead, the Rangers came out two game above .500. That’s territory they hadn’t occupied since 2016. Things were looking good. Until they ran into a force greater than Justin Verlander and Gerrit Cole and the Cubs combined. The Rangers took their first road trip of the season to Los Angeles. The Angels scored four runs in Game One, three runs in Game Two, five runs in Game Three, and seven runs in Game Four. All totaled, in four games, the Angels scored nineteen runs. Mike Trout drove in nine. One player was 47 percent of their offense. The Rangers lost three out of four. What did we learn? Mike Trout can single-handedly wreck a team. So, after ten games, the Texas Rangers, a team with a duct tape rotation, an offense in training, and a Hail Mary bullpen, is at .500. You have to admit, .500 for this team is pretty amazing. 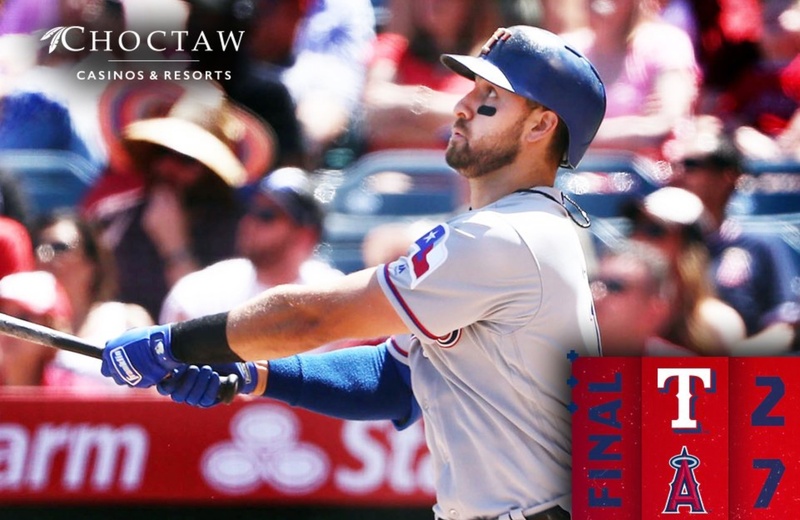 In spite of their sputtering in LA, the Rangers hit the off day sixth in the American League in batting average, third in on-base percentage, and third in runs scored. They’re twelfth in in team ERA, and fourteenth in starter ERA. And they are tied with thirteen other American League teams in NHMT: not having Mike Trout. Seems I picked a good time to miss some Rangers’ games. Though it’s always an honor to be able to watch Trout play baseball. He’s hands down the best player of this generation. Fogged in this morning in Beaufort, SC so getting a late start has allowed an internet connection …. Eureka! Yes, Trout is a wrecking machine. That said, the lack of scoring against a team that has possibly a sorrier rotation than Texas is disturbing. They did not score enough to win any of the last 3 games. They were hitting so well—and the bottom drops out. Why? Also, 10 games is enough for our star 2B to do SOMETHING. He will, of that I am confident. But, it is time for it to happen. After 10, to be 5-5 is OK. But the way it happened suggests that we are headed downhill, does it not? The worst of the 3 teams they’ve played (notwithstanding remarks about Cubs) is the one who cleans their clocks. RE: Cubs. It’s odd that many have them in the WS, whereas you have a source putting them last in the worst? division in MLB. Quite the polar opposite predictions. RE: Trout. As Rowdy and many other have said–he’s the best, in every way, of this generation of MLB players. Yet, he will play his career with a team that will never win. Just think how quickly the Angels could rebuild by TRADING HIM. They could get whomever they wanted—-a bunch of excellent players. I mean enough to win NOW. But it will never happen. As you know I am silly or stupid or both and love a good quote. One of the reasons that I respect someone that can transfer their thoughts from the brain to the keyboard like Kevin for example. Sometimes I will post quotes from famous people on here, but I stumbled across one from someone no one has ever heard of…..I liked it. I wanted honest feedback, good or bad on what yall thought, written by a young soldier in Iraq. Its how many times you rise. You keep fighting until you reach your demise. Until, you take your final breath. I don’t think that you’re silly or stupid. Quotes that live have substance to them or no one would pay any attention to begin with. The young man said some very profound things in just a few words. We would all be better people were we to heed his advice. Youth rarely has such wisdom. Perhaps being in a war, facing death, gave him such a clear perspective of how one should live. Regardless, it’s worth remembering. I would be interested in knowing how you came across the words. Thanks for posting them. Did not mean to mislead, just wanted some honest feedback…….I wrote it. Just my thoughts which isn’t worth much but it’s all I got. Mike Trout: Major league pitchers are a proud and stubborn lot. They all believe they can pitch to him and get him out. That’s just the way they roll. If they do it correctly, they probably can at least a third of the time. But if they do it like the Rangers pitchers do, meat balls center/center it ain’t gonna happen. Stop it already. You’ve seen the data, I’ve seen the data, just about everybody has seen the data. He can be had up and center in. Not every time, but at least a fourth of the time. Yeah your going to miss once in awhile, but there’s no excuse for every time. Ranger’s rotation: It looks bleak right now, but it will get better. When? I don’t know, but it will. Volquez is down and out, which means the other two should be survivors. At least that’s what the numbers say. Seventy to Eighty percent of TJ surgeries return to their former level of performance. You don’t have to look it up, I just did. Worst case: seventy percent of three is two point one. Throw out the point one and you still have two. I’m no math wizard and just did that off the top of my head, but pretty sure it’s correct. The Rangers will probably be picking some canon fodder off the waiver wire as arms become available on there. Deshields and Odor: They are going to be on very long leashes, particularly Odor, so we can have fun complaining, but we won’t get much satisfaction. Gallo moving to 1st: Aiin’t gonna happen unless management has a change of thought process. They have him anchored in LF so we can forget any ideas we may have had of him at 1B. Trout is just better than anyone the Rangers have to serve up against him. It’s really way to early to tell much about a minor league player just from stats and doubly so for pitchers, So, leaving pitchers out, there are three guys that I am really interested in at Nashville. Catcher Jose Trevino and out fielders Tocci and Calhoun. Trevino has the rep of being a top notch defensive catcher that has not been able to hit. That appears to be accurate, at least the hitting part as he’s currently hitting .070. Tocci, we’re all pretty familiar with as a guy with strong defence and hitting that showed a sudden increase late last season and particularly over the winter. That appears to be holding up, he’s currently at .333. Will the Rangers call him up if DD falters? They could, but I don’t think so. I think they’ll leave him where he is to further cement his improvements. Calhoun: What is going on with this guy is befuddling. His projections are a less than optimum fielder with a plus hit tool and has shown flashes of it. Particularly year before last, and the latter part of last year. He is currently at .167. His major league career avg is .233 over 133 AB’s, So, who is the real Willie Calhoun? Some digging into his past life might give us a clue. You can if you wish. I already did, but will keep it to myself. What does it mean? I dunno. Eventually, like with Rua, Robinson and Hanser Alberto, they Rangers will have to put Calhoun out there and see what he can do. I guess. But put him out where? I have a hard time believing that a man his age is unavoidably a defensive liability. I say that unless he knocks the cover off of the ball at AAA, that he MUST learn to play LF to a point where he is at least OK. Better than Napoli was–which he really isn’t right now. He says he has nothing more to prove at AAA and whines when sent there. Well, KMA. He can learn (at least) to play the simplest position at a decent level or he HAS NOT proved all he has to prove at AAA. They do not need him as is. Let him rot at AAA or learn to play a little D while there. Then, we have a place to put him and see what he can do. Meantime, we have better players. If DD needs more time and Pence falters, bring up Tocci. HE is the guy who has made himself into a better player and hasn’t whined about the need to do so. I don’t care how Calhoun was obtained. Until he deserves to play for Texas, he can play for Nashville. Spot on….and this is the season to do it. I don’t think he’ll ever be a reliable player. Looking into his past I discovered he’s been an habitual quitter and cry baby. His snit in RR last season wasn’t an outlier. He did it in college, which he quit when he wasn’t playing well and enrolled in a JC. He almost quit baseball. His dad who works in the CA prison system took him on a tour of San Quentin to change his mind. He has a history of quitting when things don’t go as he would like. He did all the right things this past off season and about had me convinced he had changed, then the ST/assignment to Nashville event occurred. Once again, once he got over his snit, he said the right things about not letting it effect his performance. Now he’s hitting .167, and when he’s not DH’ing, playing a less than optimum LF. Maybe he needs a sports psychologist or something. Unless something changes, and quickly, I think the Rangers have seen enough. Add to all that he has not been impressive at the big league level, where he’s a career .233 hitter over 133 ABs. Last year after the call ups when he was called up, the team said they couldn’t find enough AB’s for him. Meanwhile he sat while Tocci played LF? Short sample in Nashville this year. Calhoun needs more time there to work on his D and hitting. I take it he is being selective when at the plate. If he is working on what was taught over the winter and in ST, it takes a while to make that a routine in games. As long as he don’t cause any problems in Nashville, he should be there and be square. On Woodward and Co.- We have a Not-Ready-For-Prime-Time team, so that means getting the manager and coaches contributing more, thinking outside the box and bringing every conceivable advantage to every game by hook or crook. It means doing the unexpected. It means mixing things up, standing tradition on hits head. It means being unorthodox to the max, if necessary. And that means…. As usual, there are not many pics available when we lose games, so this will be a short picture post. Here are the pics from over the weekend. Have a good day off! Around the league…..Stros/Yanks start a 3 game series, tonight and tomorrow are on ESPN. TBay is playing very well. And poor Chris Davis is on a 0-44 streak, closing in on the all time record. I keep reading and hearing the Rangers are rebuilding, are they are we sure? The Rangers or Daniels have the 1st basemen, 2nd baseman and SS they want also the 3 outfielders they want plus the catcher in waiting. So Daniels rebuild is to find a future 3rd basemen and DH which will be easy to find. The pitching staff is a wreck and I see nothing to make the future look brighter, wait 3 or 4 years for some maybe talent to develop your going to be looking for more position players. No team develops 5 starters, look at Houston even they had to go out and get Verlander, Morton and Cole to win. I just don’t see the rebuild waiting for 2 aces and 3 jacks to come up from the farm no sir don’t see no full house in the making Maybe a couple duces. And that my friends is what we have now. 1. We’re not going all out to compete this year. 2. Finding out, once and for all, what we have in the players we’ve variously rushed up to the majors (too soon) over the 3-4 years, namely Maz, Odor, Guzman, Gallo, etc., and I’d include IKF, Calhoun, Tocci and some others plus pitching. 3. We need to get past paying for past mistakes… ARod, Fielder, Choo (maybe), etc. Clear some salary. 4. We need to give current arms time to ripen in the minors and see what we have. Agree Fielder and Choo mistakes. Arod put up Trout numbers in his 3 years here. 156 hr, 395 rbi, 249 bb, 305 ba and 395 obp. Don’t think we will ever have a player with those kind of numbers again. And we were in the same pickle with him that LA is with Trout now, only as I recall, the teams we played didn’t often let him beat them single handed… just saying. I see some sunshine through the clouds. The Rangers have a group of good pitchers coming up. They will probably have to be augmented with a free agent signing or two once the time is right. That time is not now. Some names to remember: Starters; Hans Crouse, Cole Winn, Taylor Hearn, Jonathon Hernandez, Brock Burke, Joe Palumbo, A.J. Alexy, Tyler Phillips come immediately to mind. Relievers; they have LeClerc locked up for a few years and there are C.D. Pelham, Emmanual Clase, and Demarcus (sp?) Evans aka Mississippi Mean. Outfielders, in ST you got a preview of what is probably going to be the outfield of the future; J.P. Martinez in center, Bubba Thompson in left and Leody Taveras in right. Probably the fastest and best defensive outfield around. Short Stop you have Chris Seise who is currently making a mocker of class A ball. DH and back up first base I like Curtis Terry aka The Big Rig. Third is a scramble between half a dozen solid prospects. Second, for better or worse, Odor has been locked up for the foreseeable future although there are good prospects there also. The reason for no names is their are so many infielders that are pretty well interchangeable. I like what I see in the minors. I really do. I do see what you’re saying Ed sounds like a lot of good prospects down on the farm. If Elvis doesn’t opt out he’s here for 3 or 4 more years, even if Gallo and Maz don’t ext (I think they will) there still here 3 or 4 more years. That leaves Guzman with 5 more yrs. pitching we need, were are you going to put all those position players? 1 maybe 2 that’s it for at least 4 years. Players can be traded. Unlike fans, management sees players as a commodity to be bought, sold and traded. Not pleasant to think about from a fans stand point, but it is what it is. 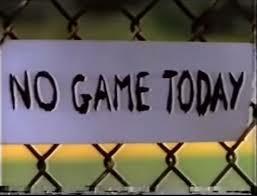 Management sees baseball as a business rather than a game. Hope it happens but been a Rangers fan since 72, heard gm after gm after gm just wait until next year let me tell y’all what’s coming. We got us a Gibson a whitey Ford and a cy young and your just have to see this a Williams and a young Babe Ruth. Just be patience it’s a coming. 40 plus years and i am stupid cause I’m still awaiting. You have a point, but what choice do you have? Stick with it and hope for the best, or quit and get your entertainment elsewhere. That’s about it for options. Tony, At least they could be batting Odor 7th 8th or 9th, don’t you think? I know that’s how it works Ed but I like to spend other people’s money GO BUY ME A TEAM hillbillies. Then if that wasn’t bad enough, before that, after hitting into a fielder’s choice, Roogie had already got thrown out trying to steal 2nd base. And would someone please explain to me why even up to last night’s game, Odor was still batting in 2nd spot? This is a continuing and a complete mystery to me, as it has been every season. Because it still seems no matter how bad Roogie is at the plate, he is still always entrenched in the # 2 hole. Yes, I know “it is still “just 10 games into the season”. But this is becoming a pattern for Odor’s career now. And I just don’t get why he keeps being put at the # 2 batting slot. Yep, and that is exactly my point, Jake. We all remember how Roogie came roaring out of a nearly entire first half slump last season. Then he capped that with an amazing 29 RBI August. He also had a couple of more good months either side of that stretch, and one OK Month in the first half. So it seems Roogie has continued this season right where he left off with it last year. So going “through this” with Odor has become a regular event. He certainly isn’t playing to nearly the level where his salary indicates that he should be playing. He keeps being “very young”. But I hope for the Rangers sake your faith is well placed. If they’re rankled, they should not be. All you’ve done is state facts. Although I could add that Nadel has missed the really important point. Not that swinging at bad pitches isn’t important, it is, but Odor has a much bigger problem. He is a hundred points or so below league average at hitting fast balls in the strike zone. I.E. when he gets a pitch to hit, he frequently misses it. In his case more frequently than not. I can’t remember the exact number, but his contact rate is about one in four. As to the line up – I have never been able to figure out why managers bat some people where they do, so I just log that to one of those things I can’t control and thus not going to worry about. It makes like much more pleasant. Thanks CrazyEd! Those are some great points! Based on those numbers, I agree that Roogie’s “chasing” pitches out of the strike zone may not be the most poignant issue with his hitting, or the lack thereof. But it certainly can’t be helping the situation any. Indeed it is and you can bet management is aware of it. If I can find it, they no doubt new about it in advance. It could be that it is the part of the “process” that we don’t see. I have no idea how you learn to hit a baseball. I always thought it was something you just could or couldn’t do. I’m slowly learning it’s a lot more complicated than that. All yesterday I was thinking if Odor dialed it back a bit and concentrated on just meeting the ball with the bat, his average and production would go way up. He looks to be one of those guys who just needs to dial it back until he’s locked in. I missed the part about Pence playing 2nd. That’s an interesting thought, but to the best of my knowledge he has never played there. Assuming he had the ability, agility, et al the learning curve would be super steep. So steep he wouldn’t do us any good this year and probably next. A quicker solution would be to call up one of the dozen or so middle infield prospects the Rangers have in the minors. None of them are ready, but at least they’d have some experience at the position. Ed, that remark about Pence playing 2nd base was totally meant as a joke. I highly doubt Pence playing 2nd base would ever be even a fleeting consideration for Rangers management. Sorry, I’m not exactly the quickest guy on the pick up. My mind is slowly headed south. You should see the machinations I have to go through sometimes just to remember a minor leaguers name. No worries, Ed! You can’t read my mind, (I don’t think 🙂 ) A little smiley face at the end of that remark would have been a big help. Nah, If anybody should pick up on stuff like that it’s me. I love puns and subtle humor. If this is now the third manager who is batting Odor second, that tells me it’s not the manager batting him there. It’s the front office, and it’s where they must want him to bat. I am with you there, Ed. I started to say that, but figured it doesn’t really matter about who the “who done it” is, as long as this keeps being the trend. There is potential on the farm, but no one that says he is fer sure. You could say that about the majority of prospects, but most teams have can’t misses, we do not. Listening to a JD I view he talked about Gallo being the best choice for 1B, but they didn’t want to do anything to rock Gallos boat. Evaluating prospects is a very difficult thing, especially at the lower levels. The people that do it for a living get it wrong more often than not. Baseball writers shouldn’t even attempt it other than as an interesting endeavor. If I want to know about a prospect the first thing I’ll do is get a reading on how he has been playing the last quarter of a season. Anything beyond that is a total waste with a young player. Their abilities have a tendency to change too frequently. I’ll augment that with 2080 baseball, baseball reference, fan graphs, baseball America (subscription required) etc. I also listen to several pod casts and read a number of baseball blogs. Then I’ll decide for my self and still get it wrong more often than not. A newspaper sports writer is the last place I’ll look. In fact, I don’t look there ever, ever, ever. Not too shabby. Thanks for taking the tine. A lot talk today about Odor hitting 2nd I agree with everyone wrong spot. For my money DD needs to lead off if he can’t then he’s useless to this team Choo 2nd Elvis 3rd Maz 4th Gallo 5th Andabell the 3rd basemen 6th Guzman 7th when he gets back Odor 8th catcher 9th. If you’ve got it, flaunt it…. at the Ticket Office so that you can get 4 tickets, 4 hot dogs and 4 fountain drinks for just $44 dollars! I am in on that. Down East is playing, bottom of the first. If any baseball player needed a name change, it’s Yonel Pozo. I have a hard time mentally not replacing the P with a B. Down East has some speed guys. Right now they are putting on a bunting demonstration. Three bunt hits in a row and the other team has been playing in..
Taveras got a bunt hit. He’s now hitting .588. The guy that couldn’t hit is suddenly hitting. I guess he doesn’t like repeating a level and is doing his best to get a promotion to Frisco. Sounds like he is working on his game. What minor league pitcher has the best control in all of baseball? Oakland has made four errors so far this season, Profar has three of them. That’s not real… Is it? I saw this on a number of sites, so yes. Chris Davis tied the major league record, hitless in 46 consecutive at-bats. He could break it next time up. That’s not real….. Is it? Chris Davis just broke the record. 0-for-his-last-47. Profar has four errors this season, and only five hits. Overtime for Basketball it is. They are building a nice lead for themselves. Angels have scored 3 runs. Trout is involved in none of them. Angels now have 5 runs and Trout was one of them. He was on first from a Walk when Bour Homered. ← Rangers reinvent concept of opener.